Intel’s investing in the student tablet company, and will be taking over hardware operations. What’s next? Intel will be leading a $30 million investment into the education tablet maker Kno, according to three of BusinessWeek‘s sources. Kno, which was founded in 2009 and raised $46 million last September, made a splash last year by announcing its dual-screen tablets with highlighting and stylus functionality. This represents a bold maneuver by Intel, which has been looking for ways to boost its presence in the Apple-dominated tablet market, as well as a great relief for Kno, which may have been a tad over its head with its ambitious hardware plans. When we first learned of the device, we were cautiously optimistic. The Kno used the same IPS LCD technology found in the iPad, had HTML5 and Flash capabilities, and generally seemed poised to fulfill its promise to be “everything a textbook was and will be.” One of our expert bloggers recently felt confident that the future of the tablet wasn’t iPad 2, but rather was Kno and others like it–tablet makers who prized productivity (that stylus was key) over entertainment. But in late February came a worrying sign. AllThingsDigital reported that Kno was looking to sell off the hardware component of its business and was “in talks with two major consumer electronics manufacturers to do so.” The swifter-than-expected rise of Apple and Android tablets made Kno’s foray into hardware production suddenly seem too ambitious, and though Kno fulfilled a few initial orders on its tablet, it had stopped shipping them entirely. Now it appears we know who at least one of those major electronics manufacturers was: Intel, it’s being reported today, will take over the hardware side of Kno, allowing Kno to focus on educational software. It’s an area in which Kno has much more experience; its co-founder Osman Rashid also co-founded Chegg, a textbook rental company. That explains what’s in this deal for Kno–which must be heaving a sigh of relief right about now. But what about Intel? Intel Capital, its investment arm, makes it its business to invest in companies that will drive demand for Intel’s hardware. It has poured $9.5 billion into 1,000 companies over the last 20 years, says BusinessWeek. And while those investments in the past have driven Intel’s striking dominance of the PC market–its processors are in 80% of the world’s PCs–Intel limps along in the tablet market. Apple doesn’t use Intel processors, but rather chips that are associated with mobile phones. How might Intel use what it acquires from Kno? Our own Kit Eaton thinks Intel might have in mind a revamping of its Classmate PC range. The BusinessWeek story overlooked a fact reported a little later by Kara Swisher of AllThingsDigital: Advance Publications, which owns Condé Nast, also participated in the funding round. These runes are a bit harder to read. Is Advance interested in the hardware, whose responsibilities have been overtaken by Intel, or the software, Kno’s specialty? 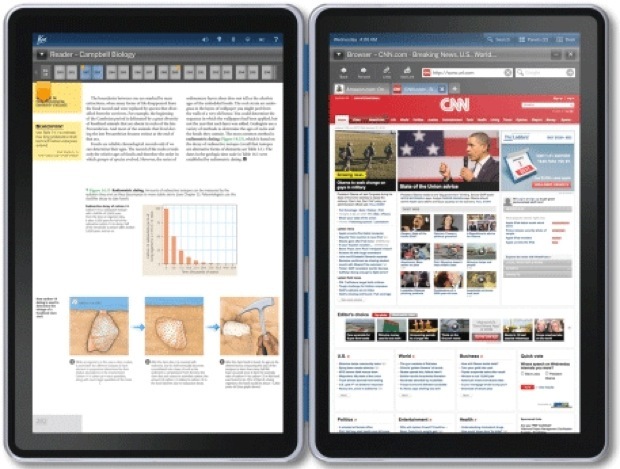 Is Advance banking on dual-screen tablets being the wave of the future–or does it have an eye on the education market for tablet software, which would be largely out of character, given Advance’s holdings? We’ve reached out to Advance for comment and will update if we hear back.